Schmitts Casino will then reward you with a bonus (Welcome Bonus is for new players only). The terms and conditions of the bonuses vary between different casinos and might also change over time and between different countries, so it is important to compare the different offers and read the T&C for Schmitts Casino before signing up. 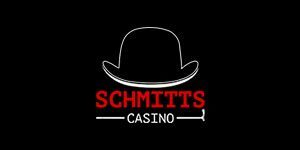 Schmitts Casino is a ProgressPlay operated and UK players oriented online venue, launched in 2016 under Malta Gaming Authority and UK Gambling Commission Licences. Owned by an experienced operator and regulated by two of the most renowned legal authorities, the casino is not that far from achieving their ultimate goal – providing a fun, secure and fair gaming platform for all those who enjoy recreational gambling as well as for the people who have a more serious attitude towards games of chance. Joining the casino and becoming one of their members is a quick and easy process, that ends with a lucrative welcome offer for all those who place their first deposit. Those who stick around and make their membership permanent will get to enjoy the casino’s weekly and seasonal promotions, and, most importantly, climb up the ladder towards Schmitts Casino VIP club, towards silver, gold, platinum, and diamond VIP member status. Privilege membership is not required to gain access to the casino’s 24/7 client support and any pressing matter can be referred over to the Schmitts Casino representatives via Live chat, or email if you require a German or Swedish speaking agent – which are also the two available options that one can select to change the site’s language settings. In case you need information about return to the player percentage, the list of all the games and their RTP rates is displayed under Game Payout, at the bottom of Schmitts Casino page. Being a featured offer in most online casinos, Slots are an inevitable category and some sort of slot variation is bound to pop up under most of the other gaming sections as well. As you browse through the offer and explore the latest or the most popular releases, you can also play slots in fun play mode and bookmark your favourite games, storing them under the relevant category. The test play can be launched by clicking on the Demo Play tag in the right upper corner of the selected game – the same spot where Real Play tag is located after the game is launched and loaded. Apart from being a great way to see how a newly launched slot is running, this is also an excellent opportunity to test drive the casino’s most popular (Featured) games: Gonzo’s Quest, Starburst, Game of Thrones, Ted, The Phantom of the Opera, etc. In addition to the regular Roulette, Blackjack and Poker editions, this category also includes Sharp Shooter, Odd One In, Six Shooter and Mike Tyson Roulette, all available in free and real cash version. Games such as Bingo, Keno, Lotto and similar releases are “assembled” under the Casual category. Not a lot of options will be found here – only a handful – but then again, this is not uncommon and these types of games are usually a negligible part of the entire casino offer. 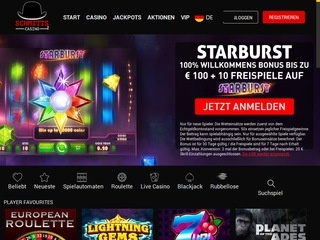 Extreme Live Gaming and NetEnt are the Schmitts Casino live tables providers but even though the casino streams live dealer games from two different developers, there are only 15 variants of Roulette, Blackjack, and Baccarat at the moment. Unlike other categories, this one requires real money wagers and the casino visitors without an active account do not have access to any of the tables. As a deposit method, the casino will accept Visa, MasterCard and Maestro cards, PayviaPhone, Paysafecard, Trustly, Zimpler, EcoPayz, Neteller, Skrill, iDeal, Sofort, Giropay, Qiwi, WebMoney, Fast Bank Transfer and Euteller. Most of the payment methods will set the deposit minimum at £/€/$20, while certain methods, such as Paysafecard, will allow lower deposit. PayviaPhone will only be available to UK based players and the 15% fee will be applied. Withdrawals have the same minimum while the maximum amounts that can be requested are limited to £/€/$5,000. The request will be processed within 3 business day and the money will be settled on the member’s account in up to 7 days, depending on the payment method selected. To contact the casino staff, the player can send an email or launch the Live Chat support. The English speaking representatives will be able to offer assistance around the clock, however, if you need answers in German or Swedish, email support will be available every day from 10 am to 11 pm. FAQ section is also available and pretty much every question that you feel you need to ask is probably already answered.